Sitting in the Library to enjoy Downton Abbey on a screen for a press reception, with the shutters firmly closed, watching the opening scene, it was slightly surreal to see Mrs Hughes opening the shutters in the very same room to welcome in bright summer sunshine. I have never quite forgotten it! All the rooms on the ground, first and second floor as well as any further outward facing rooms have these shutters, although these days we don’t open all of them all the time. They are mostly made of oak, grained weathered and immensely practical. 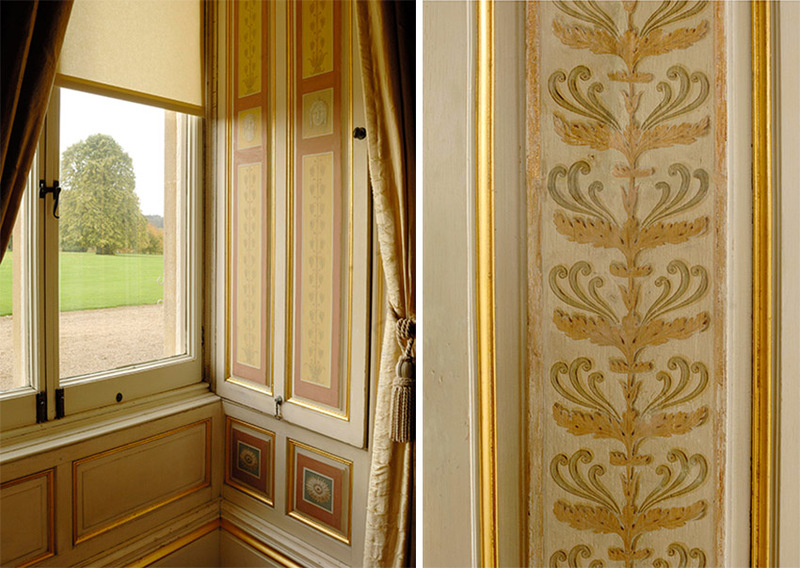 The Music Room has beautiful painted and gilded 18th century ones which we have recently had restored. I suspect the drawing room ones also need a little re-gilding if I look closely, (so I don’t) and the ones in my study often get stuck so that is yet another job to be done. The Castle has its own morning routine. For the housekeeping staff the first job every morning is, of course, opening the shutters but each department follows its own schedule. In the summer, the kitchen teams arrive at 6am (at 7 am at other times) and armed with beanie hats in the winter. The huge, high-ceilinged kitchen faces north – with high windows and no shutters! The gardeners begin at 7.30am and stop after the first few jobs for a thermos flask of tea or coffee. Outside estate staff are here by 8am and the farm office will also be busy early. Maggie will have mucked out the horses and the office staff arrive between 8.30 and 9am. My husband often goes for a run first thing and I bike round the estate with the dogs having impromptu conversations and meetings as I go. I always rather imagine the Castle dusting itself off, stretching and sitting up before settling into a new day. We have a central diary for the Castle so that, theoretically, everyone who works here should know what is happening. It is all integrated and everyone is colour coded and I try to put in everything I am doing so that it is accurate. My husband also keeps a separate shared diary which relates to him. As the Castle pages are so full, I also had the bright idea of a shared estate works diary. Paul in the kitchen runs his team off a wall chart and diary, Sally runs the gift shop team through an endless series of authoritative emails. Simon and the farm follow the seasonal cycle, David Hilton the joiner has an idiosyncratic schedule which I can never quite figure out, Les and Keith are on a 3 day week which varies with the seasons whilst Pat and her painting team meet me on a Monday to have some semblance of a plan, because I am not sure if anyone looks at the estate diary and I have rather given up too. In a more old fashioned way, I also know that I can always find the decorating team, and thus their schedules, in Pat’s kitchen where they go for tea at the end of the day. Thus, if Nick the tiler is yet again invisible, I can usually find him there. Given the diaries are shared, in order to be more discrete, we use initials and acronyms, which works well until no one can remember what it all means. I, obviously not wishing my husband to know everything, am particularly good at code but unfortunately the office does not always realise that a particular abbreviation is actually a meeting or, even more importantly, a code for “a secret planning meeting about interior matters , location TBC”. My long codes can be so good they also defeat me. In turn, my husband is running along his own track with, quite often, no reference to what is going on in the Castle which can result in “operation revolving doors”. Photo of Bonny by Joanne De G.
John Gundill (our Castle Manager of the absent fish and chips)and I regularly sit and stare at his computer, trying to give clarity to the diary. I quite like typing and having keyboard control but I have to type quickly as he grabs it back and complains about my colour coding. I can hardly sit down, of course, because he has so many piles of paper around his desk. Just when I am clarifying an acronym – an on-going project with which my husband is possibly not yet quite fully, wholly conversant, Geordie walks in. A flurry ensues and I ask him how his foals are. Every so often I propose a diary meeting on a Monday so we can try to troubleshoot the double-bookings. Perhaps at some point we shall have one. Time to close the shutters. I am in love with Bonny’s face! So precious. Interesting reading regarding all the ‘calendars’! Having had that as part of my former office job, I can sympathize. You are absolutely hilarious! I think we were sisters in another life. This describes me to a Tee! I share your pain, frustrations, confusions, and desire to keep everything on time and in order. But I also share your love of a much beloved home. I miss Downton Abbey and you always manage to bring it right back to me. Thank you! I am not sure I ever keep to time myself.. but that is life – the laughter is key!! I simply rely on post it notes, and toss as the job gets done! You have left me breathless after reading your schedule. Have a good day. Another wonderful glance into the daily goings-on around the Castle. Husbands do need to believe they have their fingers on the pulse, so to speak, of it all… but we know the real activity! Tea, codes & figuring it all out. Sometimes “peeking” through the shutters! Thank you for another wonderful bit of insight, Lady Carnarvon, into keeping it all going. And Bonny is so beautiful and very precious!! The innocence of baby animals makes me want to give them a cuddle. I’m sure I could spoil Bonnie in no time at all! Enjoyed my visit in 2016 and the Downton Abbey series very much! Kalimera! ‘Luv beautiful Bonny! How lovely to wake to sunshine streaming in when the shutters are opened. 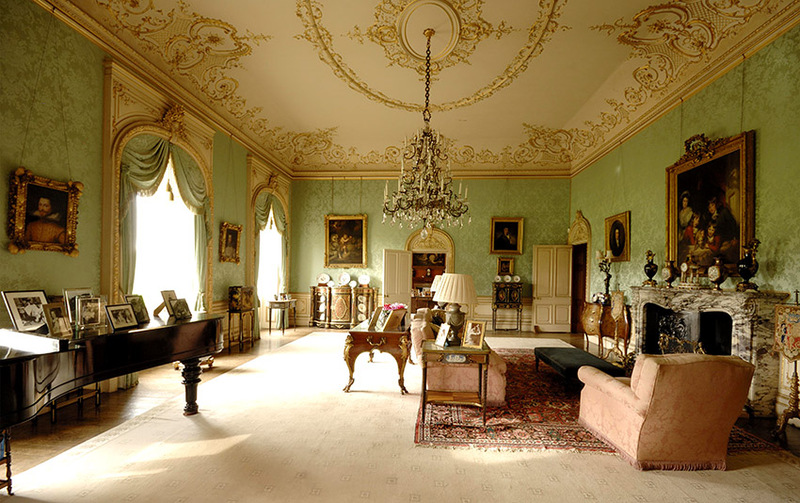 It seems so cheerful and “light” in the delicate green Drawing Room. My favorite is, however, the library… so warm and “woody”, and full of the smell of aged volumes, books with tales and history. Thank you for this blog, always a joy to read all that you write, Lady C, it makes Highclere so warm and homey! I like post it notes too! Absolutely delightful post! I love hearing about the daily workings of the Castle and applaud you and your amazing staff for your time, energy, effort, love and unstoppable good cheer. I’m 69 yrs old and retired from office work. Finally! I loved reading your post just now – makes me feel young and wistful. We were young and had no bills to pay unlike now when I own my own home and have to stay on top of things. Thank you for sharing your home and thoughts. With warmth — Shirley Susan Taylor in Midwest City Oklahoma. I wish we could send you some of our rain! What a busy day!! Managing a staff is a bit like juggling balls, isn’t it? As a former academic coordinator, I can relate. Managing Highclere Castle must be a massive job. The photos of Bonny and Highclere are stunning. Bonny’s portrait is so sweet, and her expression is just precious. Love it! I especially enjoyed seeing the Drawing Room photo. 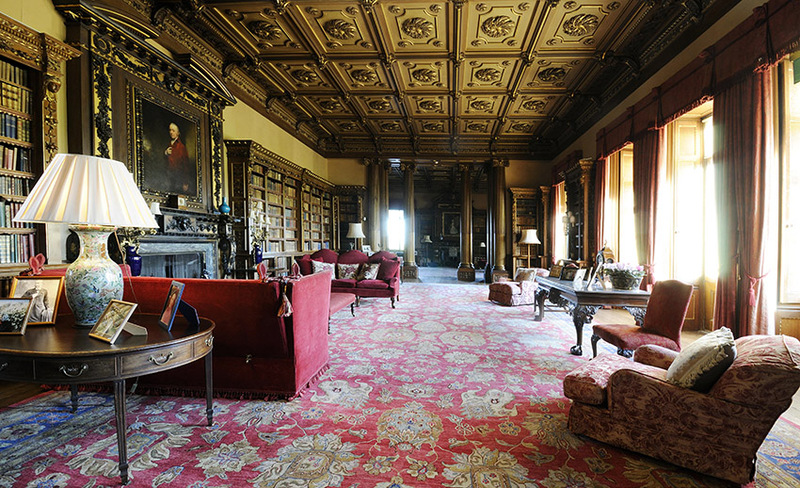 It’s my favorite Highclere room. Thank you for sharing a part of your daily life. that you graciously opened up your lovely home for this series. of the world. Thank you. I have your drawing room picture as my webpage on my computer. It gives me a sense and a warm feeling, that in some small way that I too are there as well as everyone who longs to be, but cannot in the presents be there. I so enjoy all of your letters, and bringing much of the charm of the Abbey to all. You, all have a great day, and spread some joy, and love in the world today, we all need it !! It is a lovely photo! I just love reading about life at Highclere. Thank you so much for this blog and sharing it with us. Thank you for the fun read! Planning and puzzling out those diaries takes so much time. It’s good to have all of the non-planners around us, who keep plugging away at their jobs so ably, on their own timetables, in spite of our well laid out plans! Fortunately, there’s a place for us all, as you clearly pictured to us, in describing your loyal and random teams. Thank you for the time you spend in sharing your life with us! Wonderful pictures of Bonny and Highclere. Sometimes I wish I was born in the previous century because I love all the old stuff – but I come back to my reality of modern day privileges – love Bonny soooooo cute! Growing up in San Francisco we only had the police horses in Golden Gate Park to cuddle and coo – love the blog – what a busy hive you have going on….. Sometimes I do too, but I am so grateful for washing machines, dentists and running hot water today! Bonny’s face is nice “colour coded” as well! Very sweet!!! Such lovely rooms with the light pouring in. It would be enjoyable to be the ‘shutter manager’ at Highclere. Lots of walking as well as checking on some of the most beautiful rooms in the Castle. Have a wonderful, busy, productive week, everyone at Highclere!! The light flooding in is so lovely, and today has been sunny, so everything is more possible. “Bonnie” is certainly aptly named. It looks like she is thinking, “So, what’s up for today?” too, as it sounds like you are thinking too! It is the unexpected thing(s), the ‘in-betweens’, that truly make for an interesting day. Sounds like that happens over there often. Nice of you to remind me as I start my own. I am always delighted when I see your blog emails in my mailbox. One day I hope to visit your lovely estate with my husband. We have been to England several times, but we have not been able to come your way as yet. Thank you for sharing your daily organizational challenges. Hopefully, you can get a master electronic communications system set up for your complex. Think of the efficiency of all the designated employees looking at a unified plan, then updating it in real time. With smart phones, you can see where everyone is located. Texting takes seconds. It sounds like you are doing a good job with the available resources. Time to dream bigger? It is sort of there but we are people and I think of them as such rather than employees, we are not very corporate. My focus is always culture and community rather than profit, so my dreams are different I think. The real life. Congrats sincerely!! Thanks a lot again for your story about the castle.I say again and again-it is very beautiful,magic and very attractive house with its life,traditions and secrets. You are a good story teller. Really! What about Bonny? What a human eyes Bonny has! Bonny is cute but knows she is! Lady Carnarvon – just signed up for your blog and already enjoying it. Visited the castle on a Viking cruise in 2016 – it is lovely and I enjoy hearing about it! You are so “real” – love that about you. Good luck in trying to keep everything in order – it looked like a well oiled machine when I was there. Just the “swan” part of the act – seriously we have a great team. I love Bonny’s markings. Definitely, a future Princess of the Castle. I, too, am a list maker and like to make one for my husband. He’s retired and I think having a list to check off and diary of what’s accomplished for each day keeps the mind and body active. You are a very smart lady. Someday we will be knocking at your door. Highclere Castle is on our Bucket List! Good -I look forward to the knock! Thank you for another glimpse in a “Day in the the Life of Highclere Castle”. In an earlier comment, I mentioned that I had just received my copy of “At Home at Highclere” which is such a delight! I love reading about the various guests who have visited at Highclere and all the recipes, of course. I especially like the puddings and those recipes with ingredients that are easy to come by. All the photos are wonderful especially the close-ups, which show details that otherwise are difficult to see in a regular photograph. By the way, my husband likes the books as well–he is not much for travelling but I think this book will most definitely inveigle him to give it a try!! I love that you have a sense of humor–what’s life without laughter? Sending Blessings to you and your staff and have a wonderful week. Such a lovely post. What a wonderful but important life you lead ensuring that the castle will still be beautiful for many many years to come. I was lucky enough to visit it last August and just fell more in love with it than seeing it through the eyes of Downtown Abbey. Wonderful write on the amusement of human dynamics. In my life at present, I’m wondering, do I let others manage me or shall I manage them? I’m Nick, the tiler! Best to leave shall things to the professions I say, I have far too must work to do .. I am a true sob! I forgot about Gone with the Wind, I so remember seeing the film for the first time.. This makes such wonderful reading! Love the diary idea and the fact that your husband sometimes has no idea what might be going on…as it should be! Mine often has no idea where the diary might even be located!. My favourite room is the library and I loved the photos here of the library with the light flooding in. Loved Downton but am loving reading of the daily workings of the castle. Thankyou for sharing with us here in Australia. At first, I wasn’t quite sure what you meant by diary. I think of diaries as being secret feelings journaled. But I soon figured it out and enjoyed reading about the scheduling. I’ve always wondered what it must take to keep your magnificent household and castle running so beautifully. I would think it’d be a labor of love for all to be on your Team. I should keep a diary as well – that is a good point! Hello to you in Texas Carol – I hope I will get back again soon! Again, another wonderful and funny installment on life at Highclere. You and Lord Carnarvon are true stewards to your magnificent home. Hopefully, one day I will be able to visit Highclere. I am just one person in a home much, much smaller than Highclere, and yet I keep four calendars! One in my computer, one on my desk, one in my work office and one in my purse. So far I have managed not to miss an appointment or to take care of a noted chore, but sometimes I wonder if disaster would strike should I simply keep one calendar?!? As usual, your story is an intriguing relation of how you keep things organized (or not) at the castle. I particularly enjoy your earthy style of writing, especially the humorous asides. Thank you immensely for brightening up my evening. Thank you, for another interesting look behind the scenes at the logistics, mechanics, and machinations necessary to make elegance and classic charm seem effortless. It brings to mind the vision of the elegant swan, gracefully gliding across the water, whilst feet paddle furiously just beneath the surface. Bonny is true to her name. out – as well as your husband and sometimes yourself. I think running a household like Highclere must be a challenge on the best of days and it sounds like you do a commendable job. Great blog, Lady Carnarvon! The Library is beautiful you are so right!!! New goal for the year. I want to meet Bonny. I mean, it’s only right. I understand your conundrum, I myself use my phone calendar to keep track of things color coding and alarms to reminding me. Your daily schedule is overwhelming but managing such a big house as Highclere must be a daily struggle to keep everything in check. The rooms look so pretty and big I’ve never seen anything like it thank you for posting it. Lovely picture…can we see the dogs too? Whenever I ask what we will be doing I am told “It is in THE calendar on my computer”. HA! so convenient ! I love your blog.. it keeps me feeling close to my old home, especially as The Nearest and Dearest fell and is in hospital in France, but we were meant to be in London on Thursday. So near and yet so far ! Keep warm (yes, shutters are wonderful, I can’t think why they don’t have them in Texas), and remember spring is almost here, at least in The Limousin the trees are budding already. I loved each & every word you wrote……I, too am a journal/diary kind of gal– beginning as a young girl !! To this day I continue to write my thoughts each day — and I am blessed to be alive !! …..thank you, as always for sharing your wonderful castle life with us !!! Bonny the foal is indeed beautiful! It has always struck me that Bonny is actually an adjective to describe someone, and she certainly lives up to her name. My father used to have a saying … “bonny Prince Charlie” … I guess from when Prince Charles was a boy. I was given the name Bonnie. Fortunately for me, people tell me I look like a “Bonnie”; how unfortunate it would be to have it be the reverse. The thing is, people occasionally misspell my name into Bonny, which causes me to secretly fret. 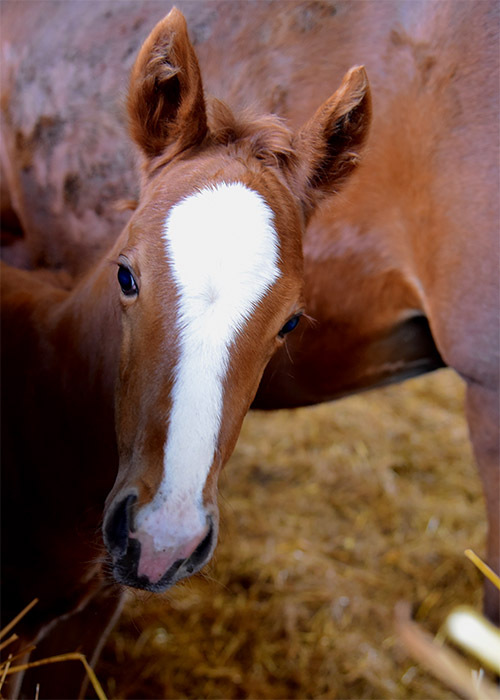 However, for your beautiful foal, the name “Bonny”, and its spelling, I think is absolutely perfect. We all would LOVE to have frequent photos and updates of Bonny. And by the way, I love all the lovely interior photographs that you included in this post. Love, love, love this post! Thank you! Oh my goodness, I’m exhausted reading this post! But so much fun keeping up with diaries and acronyms. Thank you. Well, sounds to me like a very busy day. But, I totally agree that you all have a very comfortable system full of warmth and accomplishments. The “HUMAN” part of working is the magical element that each one brings to the finished project. I was there with my niece and the one thing we noticed was the sincere joy of working in such a beautiful HOME was shared by everyone we spoke with. How wonderful to be able to share the chores of each day with such a FAMILY of loyal employees. That didn’t just happen. All right, Bonnie is beyond beautiful. I can smell her sweetness from here. Please give her an extra treat from me…as I imagine her soft velvety nose tickling the palm of my hand as she nibbles away. And, thank you for another warm visit with you on such a lovely day at Highclere Castle. Believe it or not, every night I fall asleep watching Downton Abbey. Now, I know their lines before they say them. It’s so much better than anything on T.V., and comforting. It is reassuring – a timeline! Your “blogs” are the most wonderful gifts you can give to the public. Thank you, thank you, thank you. I can so relate to secret and color coding a diary. I have my color coding remembered, but oh those sneaky little codes which makes sense at the time of posting! Thank you for sharing another lovely post. I too like the idea of a BIG calendar to write all my appointments and highly important things (to me anyway). Sadly, unless I attach a pencil and some flashing alarm on it that dings as I stroll by, I forget I have it! You may need a secret diary full of abbreviations and their meanings as well. The pictures are beautiful and Bonny is adorable. I truly enjoyed the very funny account of keeping your schedule(s) straight. I personally keep several paper calendars and computer and send myself emails from the office to home -and in reverse- as a reminder to calendar things. And yet, things will still go ‘missing’. We’re traveling to England in April and am so excited to visit your lovely home personally — we will visit the Cotswolds villages where Downton Abbey was filmed and end at the Castle. From reading your accounts, sometimes it feels like I’ve already been there. Thank you for sharing your daily life with all of us. Enjoy your day! MY LADY, YOU HAVE MADE MY DAY. I AM GLAD !! LOVELY PICTURES. THE LIBRARY IS WONDERFULL, YOU ARE SO RIGHT. BONNY IS BEAUTIFUL. THANK YOU. THANK YOU. THANK YOU. Good morning from Athens and have a great day in that amazing setting of one of Britain’s most magnificent historic homes! I love Britain’s stately homes and a few years ago I had contacted your late father-in-law who had the kindness to send me a complimentary copy of Highclere Castle’s guidebook! Please pass my best regards on to your family wishing you all the best!